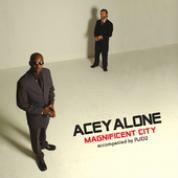 RapReviews.com Feature for February 14, 2006 - Aceyalone & RJD2's "Magnificent City"
I had a big weekend of music planned. I spend much of my free time wading through my collection anyway, but I have been in an especially musical mood lately. Alas, I only got halfway through my first selection, "Paul's Boutique," before "Magnificent City" arrived, and the arduous task of fully absorbing a record in three days began. There are plenty of tasks I would shy away from more, however, than a project involving these two artists. I had preconceptions about this album. These mostly consisted of ridiculously lofty expectations built upon my respect for Aceyalone and RJD2. Aceyalone is still a great lyricist after all these years, but I cannot forget the ease with which he twisted his rhymes around the jazz of "All Balls Don't Bounce" over ten years ago. Just as RJD2 expands the medium of the beat, Aceyalone is capable of moving in impossible directions with his voice, and the thought of a full collaboration from the two was almost too much to handle. I'm like oatmeal, peanut butter, beans and rice"
Lyrically, "Fire" is too simple. Aceyalone's words here are far from what he is capable of. He talks rather than rapping, and his trademark originality is lost among unconvincing and dull subject matter. Luckily, there are a whole bunch of other songs to look to. "All For U" opens the album with an underlying funk exploded through shining horns. Aceyalone doesn't bother constructing full verses, instead rapping intermittently while allowing the production to breathe. "Cornbread, Eddie, and Me" is the polar opposite, a thick, bombastic rhythm that leaves him no choice but to roar. "Mooore" is the first example of the experimental potential that "Magnificent City" contains. RJD2's beat is a mass of robotic bass and high-pitched beeps that swirl around the rhythm, taunting and threatening it. RJ forces Aceyalone to stretch his voice to stay on beat, and he relaxes completely on the bizarrely catchy hook. The end result is flawless, striking a cautious balance between silly and confrontational. The ensuing song, "Supahero," mocks the thought of a knight in shining armor with a similar but calmer musical structure than "Mooore." The rhythm refuses to stay steady, and Aceyalone adjusts his flow impeccably to match RJD2's hills and valleys. Still, such subject matter is plainly below an artist of his caliber. I have little interest in hearing about his romantic exploits. It's a well-done spin on the clichéd wooing rap song, but he cannot separate himself from that cliché fully enough. I believe that RJD2 is the best rap producer in the world, even though he doesn't provide instrumentals for emcees as much as I would like. He has the innate ability to craft rap music that is so remarkably soulful that it barely resembles the kick-snare simplicity that still rears its head consistently. "Disconnected" is relentlessly complex, and the depth behind Aceyalone envelops him. As a seasoned veteran, Aceyalone is far from his bong-induced free-flowing days, but years of practice have turned his flow into an extension of the beat rather than using the beat as a launching pad. RJD2 sometimes overwhelms Aceyalone, as he surely can intimidate any rapper, because of the sheer intricacy of his sounds. RJ's simpler works, such as the gorgeous freedom celebration "Caged Bird," provide a distinct rhythm for Acey to adapt to. "Caged Bird" is a pleasant anomaly, consisting melodically of incessant sleigh-bells that allow Acey to settle in and then deviate from the thumping, repetitive drums. As I had hoped, the best song on this record comes in a very unique disguise. "Solomon Jones" is a slow, bluesy folk song with Aceyalone playing the grizzled storyteller. Nothing spectacular happens; it really is a slight tale whose plot matches the woozy pace of the beat. RJD2 laces a slick, organic production paced by a beautiful vocal sample that intensifies the mood even more. In comparison to something like the shockingly ordinary "Junior," a carbon copied cautionary tale in the tradition of "Children's Story," "Solomon Jones" is even more remarkable. The overly ambitious and muddled "Heaven" follows "Junior." In places, Aceyalone lazily takes broad and tired concepts and updates them without much ingenuity. "Heaven" explores the afterlife in a half-assed manner, failing to break any sort of ground. In this case, RJD2 is left to fend for himself, and the grinding electric guitars cannot match some of his finer work on the record. Luckily, "Here & Now" regains momentum through another extraordinary work by RJ. Here Aceyalone demonstrates rare genuine emotion instead of just rapping for the hell of it. He frequently wanders aimlessly around "Magnificent City," with no help from RJD2's explosive music that will not surrender an inch. The same rapper who once claimed "I get my ink from the inkwell, my paper from the trees, I swell up when I eat emcees" has left that loony inspiration behind him. This is not RJD2's best work, but this record contains several stunning creations and very few disappointments. Aceyalone settles for too little, allowing his natural skill to carry him in the absence of true purpose, but his voice still weaves deftly throughout most of the album. Acey needs more subdued, simplistic production to reach the pinnacle, and he does not find it here. He must be in control, and when RJD2 supplies such expansive and complicated music, he is left to bend his words to fit the melodies instead of exploring his own voice at his own will. In order for them to mesh fully, RJ would have had to tone it down, and that would have compromised his own musical desires. The billing on "Magnificent City" should be reversed, because "RJD2 accompanied by Aceyalone" makes a whole lot more sense.